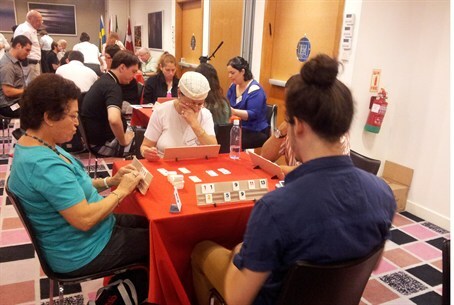 Israel holds tournament in Rummikub, the Israeli-made game that has become a worldwide hit. The Israel Rummikub championships were held this week. The game of Rummikub, invented and produced in Israel, has become a world hit. The Israeli winner was Daniella Shermar. She learned to play Rummikub as a child, when she played with her parents. She wore a necklace given to her by her father, and announced that her victory is in his memory. In second place was Nissim Naim. The Naim family takes part in every Rummikub tournament. In third place was Danny Kadman, and in fourth was 22-year-old Devora Atiya. The world championships will be held soon with contenders ages 12 to 88 taking part.